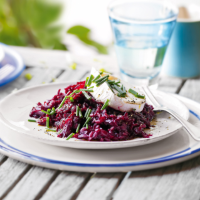 Beetroot gives this vegetarian risotto fantastic flavour and a wonderfully vibrant colour. Serve with slices of goat's cheese and chopped chives for an easy summer lunch or supper. 1. Peel the shallots and beetroots. Finely dice the shallots and grate the beetroots, or shred them together in a processor. 2. Heat a large wide frying or sauté pan, add the oil then take off the heat. Tip in the fennel seeds, quickly followed by the shallots and beetroots and stir well. Cook over a medium heat for 3-4 minutes until starting to soften. 3. Heat the juice or stock in a separate pan. Stir the rice into the beetroot and shallots, then add about one third of the hot liquid. Cook quickly until the liquid is absorbed, stirring frequently, then add half the remaining hot liquid. Cook quickly again until the juice is absorbed, then add the remaining liquid and simmer until the rice is tender and the liquid has all gone. Add a little extra stock or water if the juice is absorbed before the rice is tender. 4. Season the risotto and serve with a slice of cheese in the centre of each helping and plenty of snipped chives. Add a drizzle of walnut oil, if you wish.